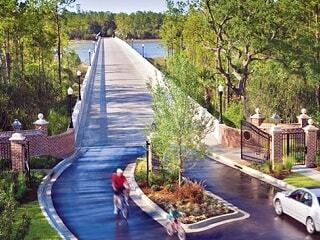 Charleston gated communities range from small neighborhoods to entire islands. One of the most popular gated communities in Charleston is Dunes West. It has one of the nicest golf courses in Mt. Pleasant, wonderful amenities, and spectacular waterfront homes. The other main gated community in Mt. Pleasant is Ravens Run, which is much smaller than Dunes West. Also, Park Island is a brand new development in Mt. Pleasant. It is a gated island within the popular Park West community, and right now only home sites are being sold. James Island has one gated community - Parrot Creek. It is a relatively small marshfront community, and some of the homes have their own private docks. On Johns Island, you'll find three gated communities. Headquarters is an island community just off the Stono River bridge. Located across the marsh from Kiawah Island, Kiawah River Estates is the only golf course community on Johns Island. Grimball Gates has a community dock, and many of these homes have views of Grimball Creek and the Stono River. 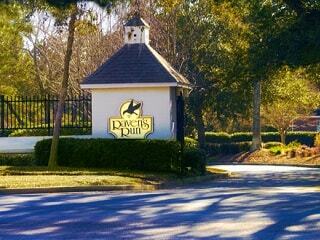 Wild Dunes is a gated beach resort community located on the northern end of Isle of Palms. Seabrook Island and Kiawah Island also offer resort-style living, and both of these remote islands are completely gated. Charleston also has some less expensive options for gated communities. Coosaw Creek Country Club is one of the nicest neighborhoods in North Charleston, and it has a golf course. In Goose Creek you'll find Crowfield Plantation, which also has a golf course. Of the many subsections, The Hamlets is one of the most popular since it has homes on the golf course. Stono Ferry in Hollywood (part of Rural West Ashley) is at least a 45 minute drive from downtown Charleston. Since it's in a more rural area, it has larger lot sizes than average for Charleston. It also has a golf course and an equestrian center. You might be surprised to learn that Mt. Pleasant has only 4 gated communities, especially since the suburb is known for its higher end real estate and master planned neighborhoods with full amenities. However, most buyers choose to forego the gated entrance when they see how upscale the area is as a whole and end up broadening their search to consider all the neighborhoods Mt. Pleasant has to offer. Dunes West tends to be the top pick among Mount Pleasant gated communities because it's the largest and has a traditional country club feel. It boasts one of the nicest golf courses in the area, complete with a low country style club house and an active social lifestyle. Its amenities center is impressive with an adults only pool, kids' pool with zero entry and waterslide, 9 tennis courts, playground, and fitness room. You'll also find a community dock, boat ramp, and boat storage. Ravens Run is ideal for home buyers looking for a smaller community since it's made up of only 5 streets. Ravens Run offers a more central location in Mount Pleasant just a few minutes off the Isle of Palms Connector. Residents can walk to numerous shopping, restaurant, and entertainment options since both Seaside Farms Shopping Center and Towne Centre are so close. Biking to the beach at Isle of Palms is also popular because of its location. This gated community boasts a 2400 foot grass landing strip for small aircrafts, crabbing dock, swimming pool, 2 tennis courts, racquetball court, and boat storage. Park Island (pictured) is a private island that has been gated off from the large residential neighborhood of Park West. Park Island feels very secluded from the rest of the suburb since it has only 33 home sites on a 30 acre island. It's accessible by a single bridge that connects it to the mainland. Its deep water homes with docks are coveted by boaters especially looking for a tranquil retreat. Homeowners can access the amenities at Park West which include 2 pools, tennis, a playground, and volleyball. There's also a small subsection of Charleston National (Victory Pointe) that's gated from the rest of the neighborhood. Few listings come onto the market each year there, so please let us know if you'd like us to contact you as listings become available for purchase. For more information on these gated communities, contact The Keadle Group! Or, we're happy to recommend other upscale neighborhoods that aren't technically gated but have the feel and amenities you'd associate with a true gated community!